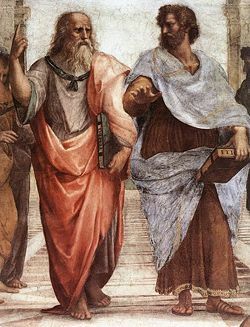 Plato and Aristotle (right), by Raphael (Stanza della Segnatura, Rome). Aristotle is regarded as the "father" of metaphysics. Metaphysics (Greek: μετά (meta)="after," φυσικά (phisiká)="those on nature," derived from the arrangement of Aristotle's works) is the branch of philosophy concerned with explaining the nature of the most fundamental aspects of the world. It addresses questions such as: What is the nature of reality? Does the world exist outside the mind? What is the nature of objects, events, places? Is free will possible in a world governed by causal laws? A central part of metaphysics is ontology, which is the study of being. Ontology is, one might say, an attempt to determine what the most basic building blocks are, out of which the rest of reality is constructed. Philosophers of different times have shown different levels of optimism with respect to how much ontology can accomplish. It appears that Plato, for instance, thought that ontology is capable of showing the existence of entities that are outside of the sensible world, but play some key role in determining the nature of that world. Many philosophers in the twentieth century, however, saw ontology as, at best, an attempt to understand the relations within a certain set of concepts used, such as that of substance, property, and relation. It is important to distinguish the sense of "metaphysics" employed by philosophers from its recent association with spirituality and world-transcending thought, though the latter does stem from developments in the former. Because metaphysics concerns itself with fundamental questions, nearly every major philosopher has devoted a certain amount of thought to metaphysics. This means, however, that a history of metaphysics would be little less than a history of all of philosophy. This article will, therefore, survey the issues that have most concerned metaphysicians throughout history. A list of historical figures especially worth considering is provided at the end. One of the central issues in metaphysics concerns how to understand the relation between minds and the world in which they exist. More specifically: Whether the most basic constituents of mind and the world were one and the same. Democritus and Epicurus, for instance, claimed that the world was fundamentally made up of indivisible particles, but held that the mind was simply a special sort of particle. Descartes held that the material world was composed of material substance, and so fundamentally unlike the intellectual substance that was minds. Spinoza and Leibniz claimed that all of the finite world had both a physical and an intellectual aspect—so that even the most simple physical particle in some sense had a mind. An even more radical position is that of Berkeley, who claimed that the material world is nothing more than ideas. The root issue is that, in the task of trying to understand what the world is made up of, the metaphysician is faced with the fact that minds and matter appear to have very different natures. One is conscious, the other isn't. One appears to be divisible and complex, whereas the other seems simple. Yet the two also appear to interact, and it is plausible (as Spinoza explicitly states in Book 1 of his Ethics) that only things with something in common can interact. Further, one intuitively believes oneself to possess at least some knowledge about the nature of the world (especially as the result of science), and this seems to require that the divide between mind and world not go too deep. In looking at objects in the world, one often will look for things they "have something in common." For instance, one might say that two apples have the same color, that two people are the same height, or that two books have the same number of chapters. But what is the nature of these entities that are "had in common?" They do not appear to be particular objects—these claims are not like the statement that two people might have a friend in common. The things appear to be "universal," not particular, in that they can be fully present in many things. There are two related questions one might raise about universals like redness, roundness, etc. The first concerns their ontological status: In what way do these things exist? For instance, would redness still exist even if there weren't any particular objects that were red? After all, people don't think that destroying one red thing has any effect on redness itself, so why would the destruction of all of them do so? But if redness could exist without any particular red objects, then it must in some way be independent of them. This points to the second question: What is the relation between universals and particulars? Are particular objects something more than just a sum of universals, and if so, what? This latter question has a close relation to the issue of change. The most extended discussions of this problem in ancient philosophy are found in the dialogues of Plato (in particular, the Parmenides). In much of his work, Plato argues that universals are more real than particulars, and as such philosophers who defend the claim that universals have some sort of independent existence are often called "Platonists." The opposing view, called "nominalism," holds that universals exist only in name—in other words, that humans merely have words that are applicable to many objects, but that there is no sense in which the words refer to some entities that are separate from particular objects. But since no river can be both 4 meters deep and 3.5 meters deep, it would seem that the river found on Tuesday cannot be the river found on Wednesday. One option is to accept the claim that the same river cannot be present at two times if there is any change. Yet this would lead one to claim that very few of the things one thought lasted through time do, since almost everything in the universe undergoes at least some change from moment to moment. Many philosophers have therefore tried to find ways to vindicate talk of persisting objects that don't involve the unacceptable claim that the same object can have incompatible properties. One option is to deny that it is correct to say that (for instance) the river has both the property of being 4 meters deep and the property of being 3.5 meters deep, since those properties are incompatible. Rather, one might insist, the river has two properties that can be described by the phrases "being 4 meters deep on Tuesday" and "being 3.5 meters deep on Wednesday." The properties described by those phrases are obviously compatible. One might describe this solution as one of time-relativizing the properties themselves. Another option is to see the object as broken down into "time-slices." The river is then seen as some sort of composite of slices that might be referred to by phrases such as "the river on Tuesday" and "the river on Wednesday." In this view, it's not strictly true that the properties of being being 4 meters deep and of being 3.5 meters deep are ascribed to the same object. Rather, they are ascribed to different objects (the time-slices), which are components of some larger object. This solution can be described as time-relativizing the objects. A third option is to relativize the relation between the object and the property. In this view, the above statements should be recast as: "The river is—onTuesday—4 meters deep" and "The river is—on Wednesday—3.5 meters deep." Though these distinctions seem overly subtle, the ramifications of the choice are very significant, for this is a choice about how to understand one of the most fundamental features of the universe: Change. Space and time are some of the most basic features of the world. Things have spatiotemporal locations, and spatiotemporal relations to each other. One of the longest-standing metaphysical questions about space and time concerns how to understand the relationship between locations and relations. Object A is at location 0,0,0. Object B is at location 20,0,0. The opposing line of thought, advanced by philosophers such as Leibniz, held that relations are more basic than locations. But relations, obviously, only exist insofar as there are objects that are related. This in turn means that objects are more fundamental than their relations, and so more basic than space and time. Talk of particular locations, for someone like Leibniz, is merely a short-hand for describing relations between objects. One of the key arguments Leibniz gave for his view was the following: Assume that the Newtonian view is correct. In that case, it is possible that every object in the universe be moved two feet to the left, changing absolute location, but with no change of relations. In Leibniz's own case, he appealed to God's rationality at this point, asking what reason God could have for choosing one location rather than another for the universe, and concluding that the question must have been confused to begin with. More recent philosophers have run the argument without the appeal to God, merely using it to point out the superfluousness of absolute location. In response, Newtonians have worried whether it is intelligible to see space (and time, for which exactly similar arguments apply) as being dependent on objects in the way Leibniz's view requires. Everything in the universe is causally determined, and what is causally determined could not have been otherwise. In acting in the universe, one sometimes could have done otherwise than he actually did. The first question addressed by philosophers on this point is whether the claims are in fact incompatible. "Compatibilists" claim that the apparent inconsistency of free will and determinism can be avoided if one properly specifies what each claim means. For instance, a compatibilist might claim that the "could have done otherwise" in (2) isn't about what really could have been otherwise, but perhaps merely what would have been otherwise if (as was in fact impossible) one had had a different set of desires of beliefs. "Incompatibilists" are those who find no compatibilist solution acceptable, insisting that no compatibilist way of understanding the claims actually captures what was originally meant. Given this, incompatibilists think people have a choice between rejecting one claim or the other. "Libertarians" reject (1), insisting that their confidence in the freedom of their wills is sufficient to convince them that the universe cannot be causally determined. "Hard determinists" reject (2), concluding that the freedom of human will is a mere illusion (both Spinoza and Hume offer interests diagnoses of tendencies to believe that human wills are free). A small number of recent philosophers have thought that developments in modern physics offered some help on this issue, particularly developments that suggest that there is no genuine determinacy. Unfortunately, the lack of determinism in such theories doesn't appear to be in the right "place." For instance, the fact that the location of particles is not determined by antecedent conditions doesn't seem to make room for human wills to be free, for the general laws of psychology still hold well enough. Though some metaphysical projects have no ambitions beyond conceptual analysis, others have, to varying degrees, attempted to make substantive claims about the nature of reality (Plato again being a prime example). But the very suggestion that philosophers are in a position to discover substantive conclusions about the fundamental aspects of reality has struck many thinkers of an empiricist bent as patently absurd. This most frequently takes form as a challenge to whether such metaphysical claims can be justified, but an important movement known as logical positivism denied that metaphysics claims could even be meaningful. If we take in our hand any volume; of divinity or school metaphysics, for instance; let us ask, Does it contain any abstract reasoning concerning quantity or number? No. Does it contain any experimental reasoning concerning matter of fact and existence? No. Commit it then to the flames: for it can contain nothing but sophistry and illusion (An Enquiry Concerning Human Understanding). The obvious premise for the metaphysician to reject in the above argument is (2), the claim that all that is known about the world is based in the senses. Plato, for instance, held that prior to birth, one encountered more fundamental aspects of reality, and merely needed sensory promptings to recall those aspects. Descartes held that God had imprinted certain basic ideas in human minds in creating them, and that we could draw substantive conclusions from those ideas. Kant, while being sympathetic to the basic anti-metaphysical argument, only accepted a qualified form of premise (1), the claim that metaphysical statements are about the world. He held that some metaphysical claims (such as "every change has a cause") are not about a world that is completely independent of humans, but rather about how objects appear to people. Moreover, the way that objects appear to people is partially determined by features of their own minds, and it is by knowing about those features that people can be justified in substantive claims about how objects will appear. Logical positivism, a movement started in Vienna that held a strong following in Britain, advanced a strong form of "verificationism," the view that the only meaningful statements were those that could, in principle, be verified by some set of observations. The positivists intended to use this view, which has at least some intuitive appeal, to do away with a large portion of religious doctrine and metaphysical disputes. Three important features of most substantive metaphysical statements, such as "every event has a cause," are their universality, necessity, and non-analyticity. In other words, they say that, with respect to entire group of things (for example, events), that each member of that group cannot exist without having some feature (that is, "having a cause"), even though that feature wouldn't be mentioned in a fully adequate definition of the group. The most experiential observations can show people, however, that some particular thing actually has some feature. No set of observations can establish any non-definitional property of everything in a group, so all metaphysical claims would fail the verificationist test. While it enjoyed considerable popularity for a time, the positivist project was eventually abandoned, for it became apparent that core statements of scientific theories (for example, the statement of universal gravitation) share some of the features of metaphysical statements, and so cannot be directly verified by observations. In the wake of positivism, their lessons were taken instead to show that metaphysical statements are not meaningless statements, but rather that they are generally not fallible, testable, or provable statements. All links retrieved September 19, 2018. Aristotle's Metaphysics Stanford Encyclopedia of Philosophy. Metaphysics Stanford Encyclopedia of Philosophy. Change and Inconsistency Stanford Encyclopedia of Philosophy. Properties Stanford Encyclopedia of Philosophy. Free Will Stanford Encyclopedia of Philosophy. Absolute and Relational Theories of Space and Motion Stanford Encyclopedia of Philosophy. This page was last modified on 19 September 2018, at 15:44.